The Volkswagen Touran (Typ 1T) is a compact MPV based on a vertically stretched fifth generation Volkswagen Golf Mk5, and sold in Europe and other select markets. It was launched in 2003 to fill a gap in Volkswagen's model lineup, below the Sharan large MPV. The vehicle is delivered in five- or seven-seat versions. 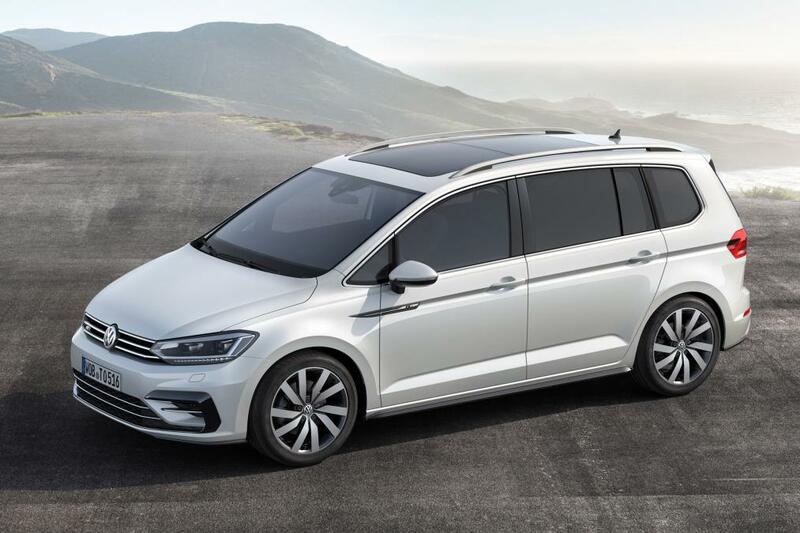 It can be considered an extended version of the Golf Plus, since their front ends are similar in size, while the Touran's rear overhang is 200 mm (7.87 in) longer (and therefore a seven-seater, while the Golf Plus is a five-seater). In some regions, such as Japan, the car is called Golf Touran. The name 'Touran' derives from the combination of 'Tour' and 'Sharan', the bigger MPV by VW. Despite the similarity of their names, the Touran is not related to the North American-market Volkswagen Routan. 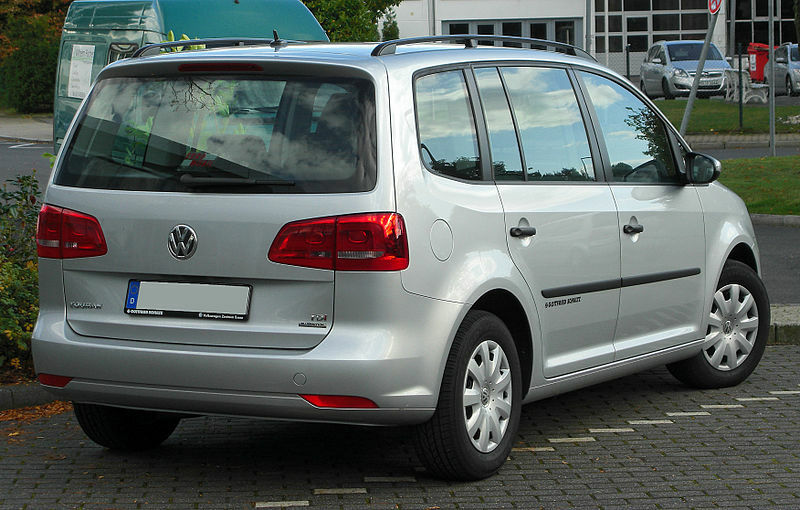 The Touran, launched in 2003, is the first Volkswagen MPV based on a Golf platform. It joined Volkswagen's existing MPV line-up that included the Sharan and Caravelle (VW Bus). The Touran introduced electro-mechanical steering, a first in its class and for Volkswagen. It is able to vary the weight of the steering depending on the road speed. Due to the lack of energy consumption in idle it also improves the overall efficiency of the vehicle. 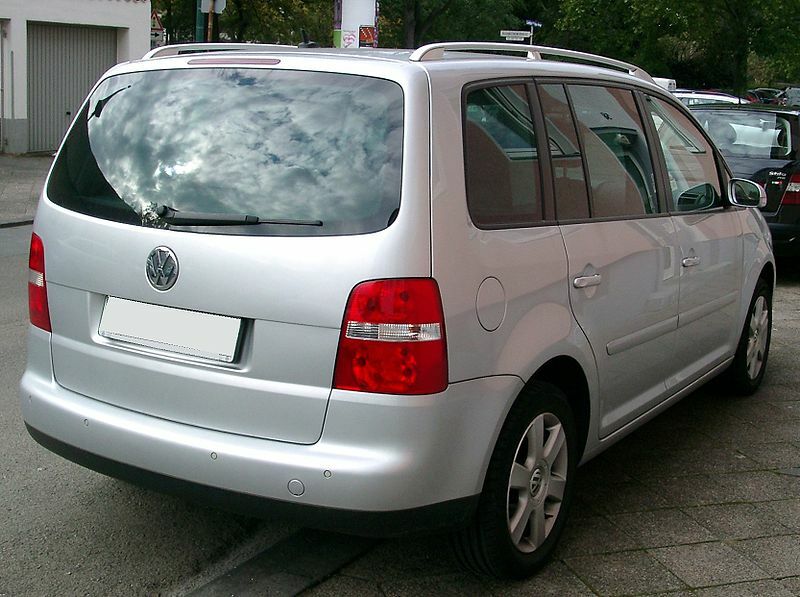 The Touran was the first vehicle to use Volkswagen's 2.0 TDI engine. The engines available at the launch included a 1.6 FSI and two diesel engines, the 1.9 TDI with 74 kW (101 PS; 99 hp) and the 2.0 TDI 103 kW (140 PS; 138 hp). The engines are EURO 4 compliant, except the 1.9 TDi when paired with the DSG (direct shift gearbox). 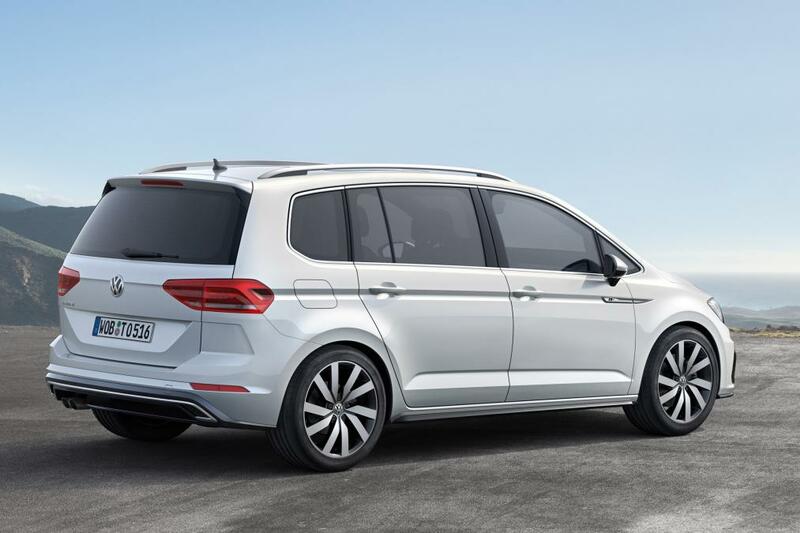 The Touran launched with a six-speed manual gearbox as standard and a DSG for the 1.9 TDI Engines. The Touran received a facelift for the October 2006 Paris Motor Show. The 2007 model year Touran was the first production vehicle in the Volkswagen Group to be released with the new Park Assist technology. Park Assist helps the driver parallel park the vehicle. Firstly, after having activated the feature and whilst travelling up to 30 km/h Park Assist uses sensors to attempt to identify a suitable parking spot (defined as 0.8 metres longer than the length of the vehicle). The driver then stops ahead of the parking spot, releases the steering wheel, but continues working the gears, accelerator and brake pedal as advised by the display panels, as the Park Assist controls the steering to park the vehicle. At the December 2006 Bologna Motor Show, Volkswagen released the third Cross vehicle designed by Volkswagen Individual GmbH. The CrossTouran is distinguished from a standard Touran by its 17-inch alloy wheels, redesigned plastic guards which ape a crossover vehicle, and a 15 mm (0.59 in) higher suspension/chassis setup that is optional for standard Tourans in Europe. All CrossTouran engines are EU4 compliant. 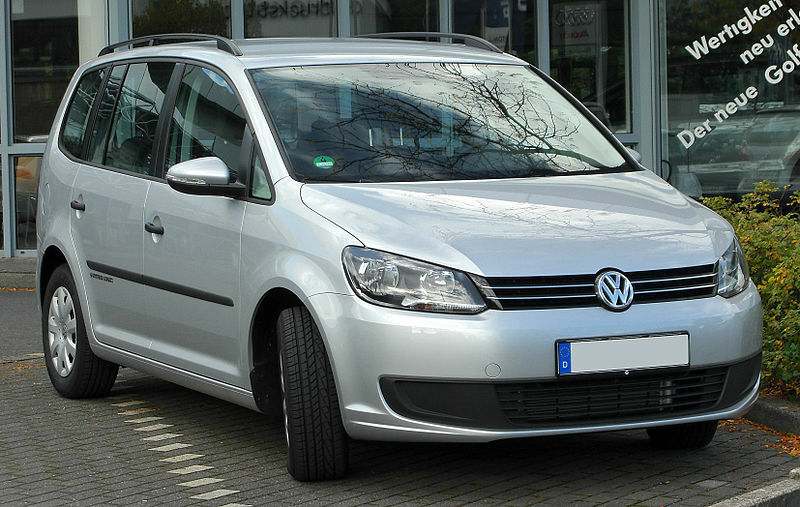 In August 2010 the Touran was updated to the newer Golf VI platform (PQ35). This includes as new features compared to the previous facelift the option for DCC (Volkswagen's adaptive suspension system), Light-Assist for Xenon Headlights, an improved Park-Assist System being able to handle also perpendicular park positions and updated infotainment systems. The aerodynamics of the car were also improved, the Cw improved from 0,31-0,32 to 0,29. At the end of 2010 Shanghai Volkswagen Automotive released the new Touran in China. Though its front is updated to the German style, the tail keeps the design of the phase II model. But the electronic systems of this domestically produced car has been upgraded as its relative in Europe. A 1.4 TSI which can output 93kW is added to the new model. New engine are available following the downsizing trend, a 1.2 with 77 kW (105 PS; 103 hp) and a new 1.6 Common Rail TDI with 66 kW (90 PS; 89 hp) or 77 kW (105 PS; 103 hp). They replaced the 1.6 and 1.9 TDI from the previous model. The 1.2, 77 kW (105 PS; 103 hp) and 1.6 TDI 77 kW (105 PS; 103 hp) are also available as BlueMotion, Volkswagen's low fuel consumption vehicle program. The Touran is available with petrol, diesel and compressed natural gas (CNG) engines. The diesel models of the Touran offer better fuel economy. Given the proper conditions, it is possible to achieve over 60 mpg-imp (4.7 L/100 km; 50 mpg-US) in a diesel Touran. The car is delivered with a five- (1.6 only) and six-speed manual transmissions, Tiptronic six-speed automatic transmission (in 1.6, 1.6 FSI and 2.0 FSI (2003-2006 only)) or the DSG twin-clutch automatic transmission; the 1.4 TSI, the 1.6 FSI from 2003 to 2006, the 1.9 TDI from 2003 to 2008 and the 2.0 TDI uses the six-speed version, and the 1.9 TDI since the middle of 2008 use the seven-speed dry-clutch version. As for the 2010 model, an updated version of the 2.0 TDI engine was launched with common rail technology. The engine was introduced in the Volkswagen Passat in the 2008-models. The Touran Hy Motion is Volkswagen's Hydrogen Development concept. It has a nickel-metal hydride battery which produces 80 kW (107 hp), it does the 0–100 km/h (0-62 mph) sprint in 14 seconds and has a top speed of 140 km/h (87.0 mph). In 2008, Shanghai-Volkswagen with Tongji University had released a Touran Hybrid as part of the lead up to the 2008 Beijing Olympic Games. 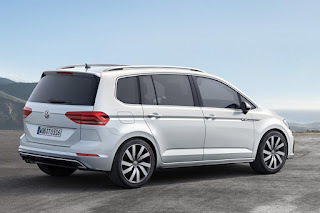 A prototype of the Touran Hybrid was shown with a 20 kW (27 hp) electric motor in conjunction with a 110 kW (148 hp) petrol engine, the transmission will most likely be Volkswagen's Direct-Shift Gearbox (DSG). The Touran won What Car? 's 2005 Compact Van of the Year award. The Touran scored a maximum 5-star EuroNCAP crash safety rating. The third generation Touran was introduced at the 2015 Geneva Motor Show. It uses the Volkswagen Group MQB platform and offers increased cabin space, six new engines with 19 percent less fuel consumption, and an array of new advanced driver assistance systems and infotainment options. Last updated on 15 August 2015 at 11:41.